Anita Socinski rocks the world of high-end countertops, fireplaces, backsplashes and vanities through A&M Stoneworks, a custom-carving business she founded in 1996. (The "M" was a business partner who's no longer involved.) The Colchester resident has stone in her bones: She grew up around Densmore Monument, a South Burlington shop long managed by her family, and where she learned the trade. Now Socinski is one of few women in the stonecutting field, one that demands 50-hour work weeks handling 1000-pound slabs of stone with her employees, Steve Perron and James Cicaloni. As a business owner and a single mom who raised two sons, now 20 and 16, Socinski has little free time for the Adirondack guide boat she's building, the house she's remodeling in Colchester, or the mountains she loves to climb. But custom installations mean she can escape the daily grind for travels around Vermont and New Hampshire. 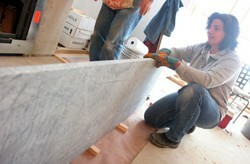 Recently, Socinski carved out a few moments to speak with Seven Days about stonecutting at her showroom in Colchester's Creek Farm Plaza. SEVEN DAYS: I understand you were sort of introduced to the family business at age 7 - can you tell me more about that? ANITA SOCINSKI: My dad had to go out to cemeteries to get a rubbing, because people would have a family plot. He'd go out and check the lettering that was previously done. I was young, and it always seemed like we were out there in the middle of the night. It was dark and there was thunder and lightning and we had the radio on, and I'd be in [the car] by myself while he ran out to get the rubbing. It was like a ghost story. It was scary. SD: So I guess that didn't turn you off from the stone business. Did you always know this is what you wanted to do? AS: I didn't, actually. You want to see what else is out there. I worked for Electronic Data Systems and I was the mailroom supervisor, managing people; that worked out pretty good, I worked there for five or six years. Then I decided to start working at the medical center hospital, as a secretary, and I wanted to be a nurse, but I had a child and it was hard to go to school and take care of the child. SD: You're one of the only women in the field - what's that like? AS: You know, the guy contractors that I meet are very supportive and very . . . I don't want to say in awe, but they kind of are. They're happy to have me there and want to see me succeed. If they see any woman that's working hard, they're going to respect them. I do exactly what they want, when they want it, and that's the way it's always been. And women are capable of it. It's very interesting work. SD: What are the appeals of your job? AS: Working with a natural product made by the earth, and seeing how it reacts to things it comes up against. Every stone has a different hardness and density. SD: Where does the stone come from? AS: All over the world. Every country has probably seven different kinds. From Vermont, we have Danby white marble - I like that. It seems like people are looking for Vermont products, and they've shied away from marble because it's very soft, but it's as dense as some granites are. SD: What's the most popular stone? AS: Soapstone, and marbles are coming back around. Soapstone's gotten a lot of publicity. Martha Stewart had it on her show, and it's been on "This Old House." It's just a really nice thing to have, and it captures the feeling of an old country farmhouse. SD: How do most people find you? AS: Through their contractor. I have probably 15 high-end contractors that I work with, who have some multi-million-dollar projects going at a glacial pace. I might know about the project two years in advance. SD: So what's a typical day like? AS: I try to be here four days a week and then go install. I'm gathering information from the contractors and ordering materials for the job, which is time-consuming. SD: What about the physical demands? Do you have to be very strong? Do you have to work out for work? AS: You have to be strong, yeah. But I get a lot of repetition here from picking up pieces every day. I can be on the end of a counter that weighs 300 pounds. But I know how to lift, and the other person has to know how to lift. You can hurt yourself pretty badly. But I've got all my fingers. SD: What are the hot areas for stone right now? AS: Kitchens, bathrooms, fireplaces, shelves around the kitchen, backsplashes. SD: What's the most expensive stone? AS: There's a manmade stone, it's about $300 a square foot. But natural - I'd say the blue pearl, which is shimmery and has a lot of different flecks of color. SD: Do you have to counsel against certain types of stone? AS: Yeah. An example would be polished marble on a countertop. Some marbles hold up in a bathroom, like the Vermont Danby white, but others will get water spots, so I recommend people hone it, which means just taking off the high polish. SD: What's the most unusual project that you've done? AS: We did a staircase out of limestone. All of it came from Belgium, and some of the pieces didn't come in quite right, and everything had to be flush. That was a memorable one. SD: Seasonally, does the pace change? AS: Oh, yeah. And in the last 11 years, I've never had a slowdown like I had this year in January and February. Just after Christmas I was ready to start on a job and they put the brakes on, so I was without something to do for a couple of months. I didn't know what was going to happen, with the economy and the war. Nobody wanted to spend money. It was weird. SD: Do your kids have an interest in following in your footsteps? AS: They do. I'm telling them to see what else is out there beforehand. It can be OK. It can be stressful. You really have to be an organized person and have the confidence to project that you can do it. SD: And what are the benefits of stone over another material? AS: It's a good feeling to know that - since we're environmentally conscious - you're doing something that's not harming the environment. It doesn't take a whole lot to get the stone. It's a lot of people hours, but it's not harming the environment to get it out of the earth. And it lasts forever.